According to the latest research from Strategy Analytics, Apple’s iPhone 6s was the world’s top-selling smartphone model in the second quarter of 2016. Apple currently accounts for two of the three top-selling smartphone models shipped worldwide. The full report, Global Smartphone Shipments by Model: Q2 2016, is published by the Strategy Analytics Smartphone Model Tracker (SMT) service, details of which can be found here. Numbers are rounded. The numbers in the data-table refer to the entire smartphone market for all platforms combined. So Samsung’s new top selling phone Galaxy S7 Edge sold 8.3 million in entire quarter. That is less than what either iPhone 6s or iPhone 6 sold during their first weekends at launch. Maybe I ought to jump to Apple somehow? 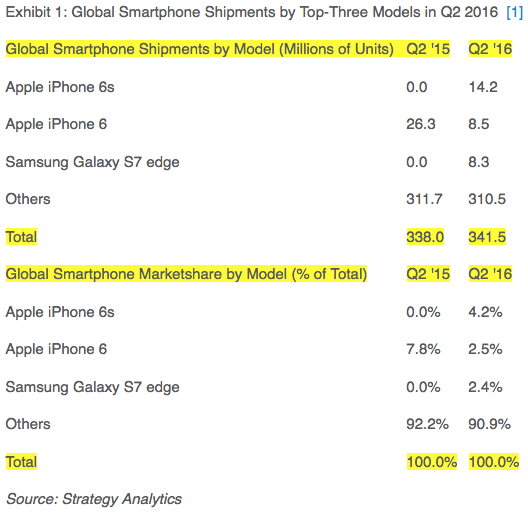 More proof Apple is doomed and Android dominates. The big investors already smell the Apple rotting. Apple stock is performing as expected before the Apple event. Disappointment fills the air and the scent is downright putrid. Wait, 748, maybe Samsung needs me more than ever now. Notice after all these years how “shipment” is still regarded as being the same as “sold”. If a really crappy manufacturer were ever to end up in a situation where they sold something like a smartphone that caught fire and then they subsequently were required to swap it for a different one, that single sale would count as two shipments, but their profit margin would plummet.